Cheong-wing is a paralysed and hopeless divorcé in need of a caregiver. He has scared off the previous ones with his cantankerous attitude and it looks like his new live-in Filipino domestic helper, Evelyn, will be the next walk-out. That doesn’t happen. Due to tough personal circumstances she has had to come to Hong Kong to earn a living even if that means enduring a hard to please client. Living under the same roof in a public housing complex, these two strangers develop an unlikely relationship as they learn more about each other and overcome life’s difficulties and rediscover their dreams together. Just when they think they have lost all hope, little do they know, life still has a lot to offer. 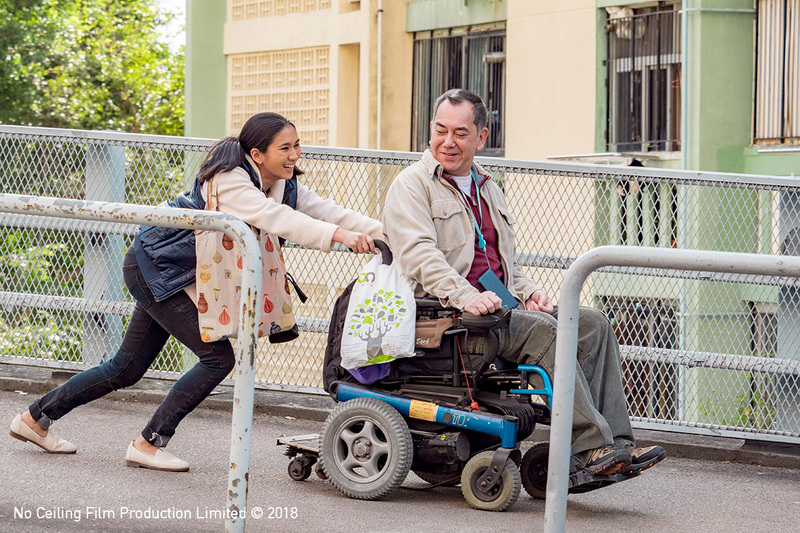 With a focus on the dignity and dreams of the disabled and Filipino guest workers, it shines a light on unheralded parts of society and has proven to be a crowd-pleaser with its unmitigated sentimentality and kindness delivered with winning performances from the cast, particularly Anthony Wong, Crisel Consunji and Sam Lee. When I was shooting this film, a lot of friends asked me if this story is real or fictional. Even though this is not adapted from any real events, the more I think about it, the more I realize this original story is actually a collage of fragments from reality. When I was young, my mother injured her spine in an accident. She spent decades of her life sitting on a wheelchair, my elder sister had to give up her studies and take up the responsibility to be the caretaker of the family. I was lucky enough to be able to continue my studies, but I had always hoped that one day I could also provide for our family of three. At the time, life was bitter, but now as I revisit the past, it was the best time of our lives. Because of these personal experiences, I had always wanted to make a film about the disabled and their caretakers. On a random day a few years ago, I happened to see this: a Filipina standing behind the wheelchair. On the wheelchair was a middle-aged man, and they were cruising on the streets. Her long black hair was flowing in the wind, and they both had a big smile on their faces. It was a sweet sight. My immediate reaction was: that’s inappropriate, right? But when I thought twice about it, I realized my thoughts were in fact, more inappropriate. Two strangers from vastly different upbringings and cultural backgrounds were brought together by fate. Although they have different stories, they become the closest person in each other’s lives. It is actually a very beautiful thing. This was how I got my inspiration. I was certain that I wanted to tell a story of two people similar to the two I saw on the streets. I wanted to question what it means to love, to dream, and all the beautiful things in life through different circumstances and relationships. Are these things that every person deserves? Why is it that when the vulnerable pursue their dreams, they are considered unrealistic, or even disgusting? How should people who’ve hit rock bottom in life face the rest of their lives?